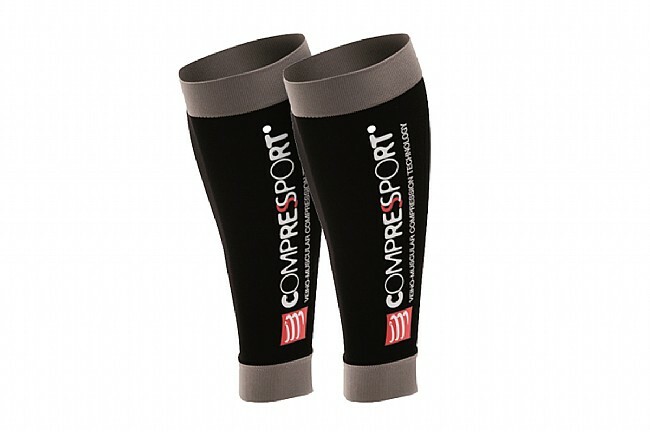 The Compressport R2 Calf Compression Sleeves are a during-activity sleeve that does double-duty promoting blood flow to the calves, while simultaneously reducing impact shocks. Made from a highly durable, ultra lightweight fabric, the R2 calf sleeve keeps a steady supply of oxygen- and nutrient-rich blood coming into the calves, and preventing blood from stagnating or collecting. Designed for more effective venous return from the feet to the heart, reducing build up of lactic acid in the muscles. Improves oxygenation to muscles, reducing possibility of cramps and injuries. Optimizes heat exchange and moisture wicking, helping to keep body temperature regulated. Calf Circumference 12"-13½" 13½"-15" 15"-16½" 16½"-18"
These compression sleeves are very comfortable. They stay up on my calves well (unlike other brands I have tried) and they provide a good amount of compression. The wide bands on the top and bottom are more comfortable than calf sleeves that don't have bands. I definitely recommend these.